Rolf Lewis for picking up M&E design work extremely well and being a fantastic support to the team. Josh Strachan for setting the pace with his continued hard work and dedication in securing projects for new clients. In 2016/17 there have been 30 construction industry deaths in the UK. In this post we will outline the most lethal hazards our industry is faced with. What can YOU do to make our working conditions safer? We all know in our trades there are a lot of tasks that involve working at height. When I was an installer, I remember that not a day went by when I wasn’t up a ladder, on some steps, or on a scaffold. This is the highest cause of injuries and fatalities in the UK, with the risks associated with working at height often magnified by the need to work in or above access routes that are in use, as well as smaller and restricted spaces. Think safe – stay safe! Unfortunately, everything we do involves manual handling, from carrying our tool bags to unloading materials! We can’t wrap ourselves in cotton wool but we can make smarter decisions to ensure we minimise risks to ourselves every day. Assess the load and get help, don’t struggle alone! Construction sites are usually a busy hive of activity with many tasks happening simultaneously. When you look around, you will see multiple hazards whether it be material and waste waiting to be cleared up or holes and trip hazards on the floor. There is no way any site can be tidy all the time but help yourself and everyone else around you by tidying up as you go rather than waiting for the end of the day. Don’t just walk by, if you see something, act on it! On average, three construction workers are electrocuted each year during refurbishment work on both commercial and domestic projects. There has been a growing trend for unqualified persons carrying out electrical work. Make sure anyone doing your work is qualified to do the job whatever the trade! Let’s all try and change that little bit and aim to get ourselves and those around us home to their families every night. Is that shortcut really worth it? 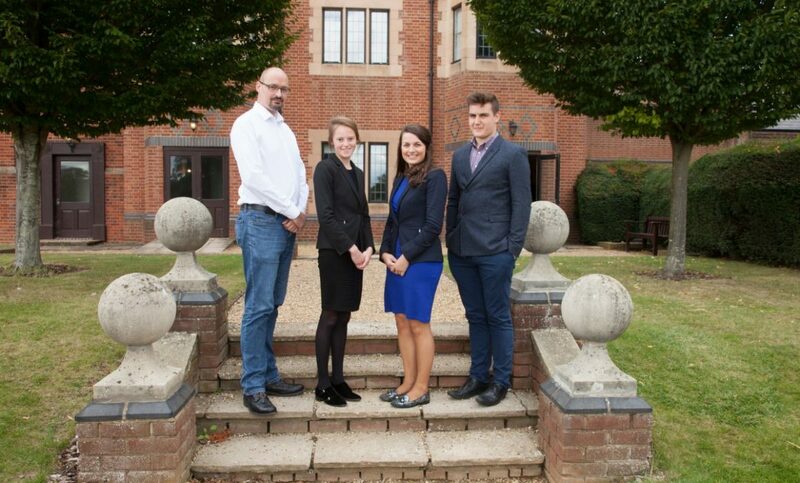 A fantastic team event was held on Monday 11th September at the Hanbury Manor Hotel. 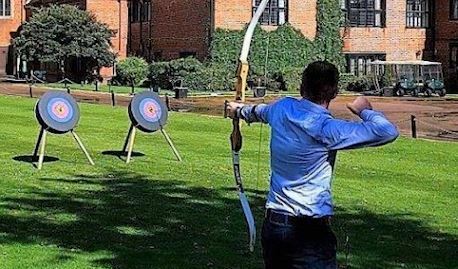 The go-forward plan was presented, there was a team brainstorming session and team building events consisting of traditional archery and a slightly more aggressive version – archery tag! This was an excellent opportunity to continue to build on the brilliant team culture and align the team to our vision, mission and targets. 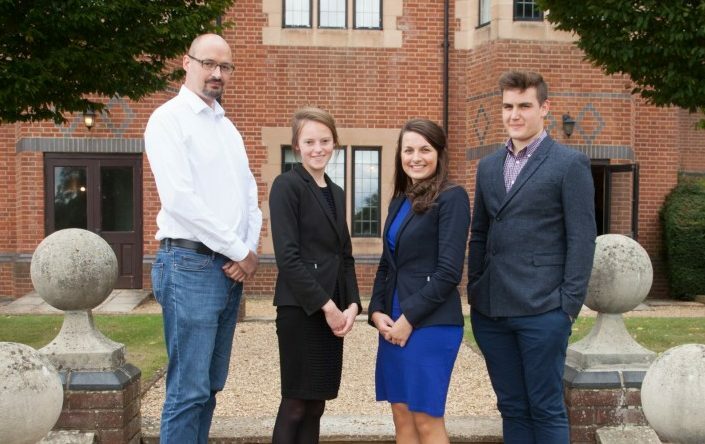 We are really looking forward to continuing to support our clients with this extra resource and maintain the outstanding service that is so ingrained in our culture. Don’t let this be YOUR property! It’s the kind of picture that makes any property owner feel uncomfortable, imagining all too well the crippling devastation, water and smoke damage that will appear once the fire has been extinguished – not to mention the risk to human life. Fire safety is a topic that was brutally brought to our attention in the wake of the recent Grenfell Tower tragedy. There are building regulations in place to help protect us from the danger posed by fire, and all buildings – whether residential, commercial, or public use – have to comply. Ensuring that any outbreak of fire is restricted from spreading through a building involves areas we don’t usually see. Today we are focusing on ducting, which typically interconnects all the rooms in any larger building and can act as a conduit for fire and smoke in the event of an outbreak. The British Standard 9999 Code of Practice for Fire Safety in the Design, Management & Use of Buildings requires all ducting, whether it is for ventilation, heating or air conditioning to be fitted with fire dampers. Every building with internal fire-resistant rated walls which are connected by a ventilation system must have fire dampers. It’s a legal requirement for every fire damper to be tested every twelve months by a method known as ‘drop testing’, in compliance with BS 9999. Most of these fire dampers have a fusible link, which is defined by BS 99999 as a ‘device that releases a component such as a fire damper or fire shutter at a set temperature.’ When the fusible link comes into contact with high heat, it will melt, causing the damper to close and stop the spread of fire. Who is responsible for fire damper maintenance? If you own a building that contains fire dampers, it is your responsibility to book regular tests for these life-saving devices, and to ensure that a proper maintenance plan is followed. By ignoring this requirement, you put both yourself and the occupants and users of the building at risk. No doubt you remember learning the seven colours of the rainbow, maybe using the useful phrase “Richard of York Gave Battle in Vain” to help you recall all the colours – Red, Orange, Yellow, Green, Blue, Indigo, and Violet. Together, these seven colours make up the ‘white light’ that we are aware of every day. ‘Colour temperature‘ is a way to describe the appearance of any artificial light source. It is measured in degrees of Kelvin (K) on a scale from 1,000 to 10,000. Typically, the Kelvin temperatures of commercial and residential lighting fall somewhere between 2,000 K and 6,500 K on this scale. The colour temperature of a light bulb or unit lets us know what the look and ‘feel’ of the light produced will be. It is assigned using a measurement known as correlated colour temperature (CCT). For example, if you heat up a metal object, the object appears to glow. Depending on the Kelvin temperature that the metal object is being heated at, the glow will be various colours, such as orange, yellow or blue. Thus, the colour temperature of light bulbs is meant to replicate the Kelvin temperature of the metal object. for you to choose lighting that gives you the look and feel you want. In many of the commercial projects we are involved with, Integra recommend light fittings with a colour of 4000K. This gives a bright, crisp feel to the working environment without creating a harsh glare. For a residential environment on the other hand, we would normally go for a warmer light, as it appears softer and gives a more relaxed feel. It is very important to choose the right colour temperature for the right application. This is especially the case in industries sensitive to colour rendering, such as food and clothing. At the lower end of the scale, from 2000K to 3000K, the light produced is called “warm white” and ranges from orange to yellow-white in appearance. Colour temperatures between 3100K and 4500K are referred to as “cool white” or “bright white.” Light fittings within this range will emit a more neutral white light and may even have a slightly blueish tint. Above 4500K brings us into the “daylight” colour temperature of the light spectrum. Light units with colour temperatures of 4500K and above will give off a blue-white light that mimics daylight. 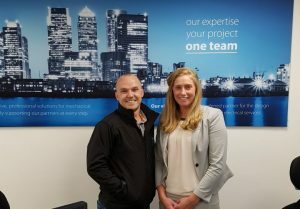 Carla Remmington has scooped the award for her consistent support of the team and her exemplary dedication in going the extra mile to meet deadlines. Dan Bruce also joins Carla in the celebrations. Since joining only 8 weeks ago Dan has wowed the team by successfully completing a challenging Cat A project at the Metro Building in Hammersmith. Since this country voted to leave the EU in June 2016 there have been many concerns about the potential impact on availability of both skilled and unskilled labour for the construction industry. However, there is another trend developing which stands to benefit from any forthcoming labour shortage. In fact, there is every possibility that Brexit might accelerate its rise. That trend is, of course, automation. While it may be difficult to imagine robotic replacements for electricians and plumbers any time soon, could we see some changes to traditional construction methods to take advantage of new technologies? Transportation of materials and equipment is a key overhead for companies in the construction sector. The concept of driverless cars is one we are becoming familiar with, but it is in the transportation sector that this emerging technology could first be seen. The requirements for HGV drivers are increasingly onerous, with limited working hours and regular training needed. That could be less of a concern in the future, as Tesla are reportedly planning to reveal a fully-electric truck with autonomous driving features later this year. The technology for self-driving vehicles is improving exponentially, and it is widely expected that the regulations governing their use on the roads will be opened up once sufficient safety standards can be reliably met. There are other areas where driverless automation technology could revolutionise the building site of the future, from the delivery and distribution of material to tasks such as bulldozing, digging and cranage. Of course, having driverless vehicles moving around a hazard-filled, constantly-changing building site will require considerable planning and programming. Firms like Skycatch are already working with construction companies to facilitate these developments, providing real-time data capture and processing. Using digital images taken by drones (which are themselves capable of fully autonomous flight missions, where regulations allow), 3D maps can be instantly updated and wirelessly transmitted back to base, enabling driverless vehicles to have an “awareness” of their surroundings beyond what their sensors alone can detect. Also showing great potential are recent developments in 3D concrete printing, with some claims that entire houses will be manufactured/printed on site in as little as 24 hours. The picture above is of a recent project that was 3D printed in one day, unlikely as it may seem! It would seem likely that 3D printing will assist in speeding up and reducing costs on structural elements, and also facilitating bespoke one-off designs which would otherwise have been too complex to consider. Taking this a step further, the trend towards manufacturing and assembling buildings in sections is likely to accelerate, especially for new build projects which do not have to be fitted around existing site features. Holiday Inn amongst others has built modular hotels, with one in Manchester which is nearing completion. Electricians will be interested to note that the Portacabin-like modules of this new development are described as being delivered with “plug-and-play” M & E services! In summary, it seems that technology will have an increasing impact on the construction industry, but as an evolutionary (rather than revolutionary) process. We can foresee that in the medium term, the labour market is likely to continue to become tighter, with pressure on costs and high-quality delivery at a premium. 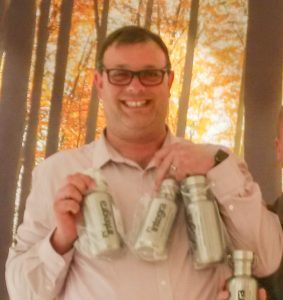 Ian Lewis scoops the employee of the month award for June for his continuous positive energy and hard work. We all enjoy working with Ian and he is someone who is always willing to go beyond his call of duty – A true testament of the Integra culture. To give you the best possible service, we have been upgrading some of our systems and infrastructure here at Integra. With tight deadlines to hit and multiple installation teams that require constant coordination, it is vital that every team member is fully connected and equipped with the resources they need whether in the office or out and about. Here’s a quick tour of some of the systems that we rely on to help us keep your projects on track! Fed up with trying to get hold of someone on their mobile, only to realise he is at the other side of a screen from you with a desk phone glued to his ear?! Us too. Old, multi-extension phone systems have seen their usefulness plummet as the smartphone became the default No. 1 means of communication. 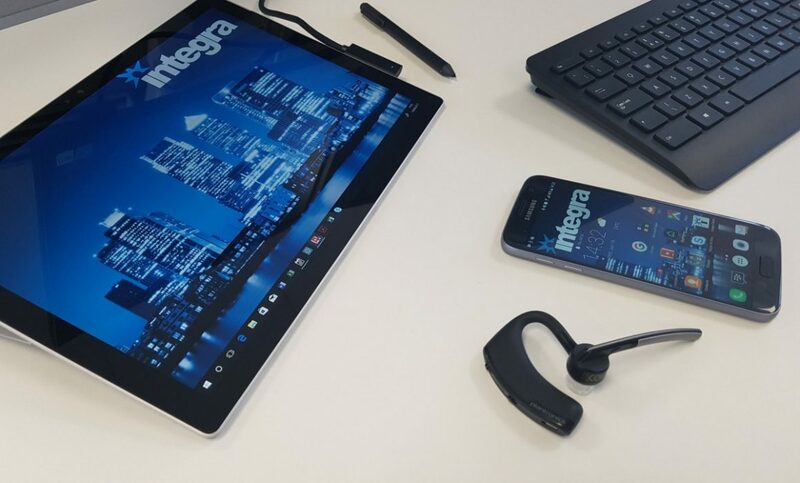 Integra’s Vodafone OneNet cloud-based phone system changes all that with fully-integrated smartphone handsets, so every team member can take internal and externally-transferred calls whether they are at their desk or out of the building altogether. It even allows us to turn any call between mobiles or desk phones into a conference call, allowing fast problem-solving and decision-making with all the required persons together on the call. Our smartphones are complemented by Plantronics Legend UC headsets so we can answer calls using voice commands even when our hands are full and continue longer conversations without risking severe neck strain! We also utilise Skype for business so we can video call any extra expertise we need, right to your site. Surface Pro 4’s are now the standard for Integra PCs. These powerful and flexible workhorses allow digital mark ups of drawings and hundreds of other features that help each team member to be productive and keep all the relevant information at their fingertips. Robust and reliable Samsung Galaxy S7 Phones connected to Microsoft Office 365 keeps documents and emails in sync, allowing for smooth transitions between smartphone and PC. With all the software security breakdowns recently, from the NHS to British Airways, you’ll be relieved to know, protecting vital information and systems has always been a key priority at Integra. 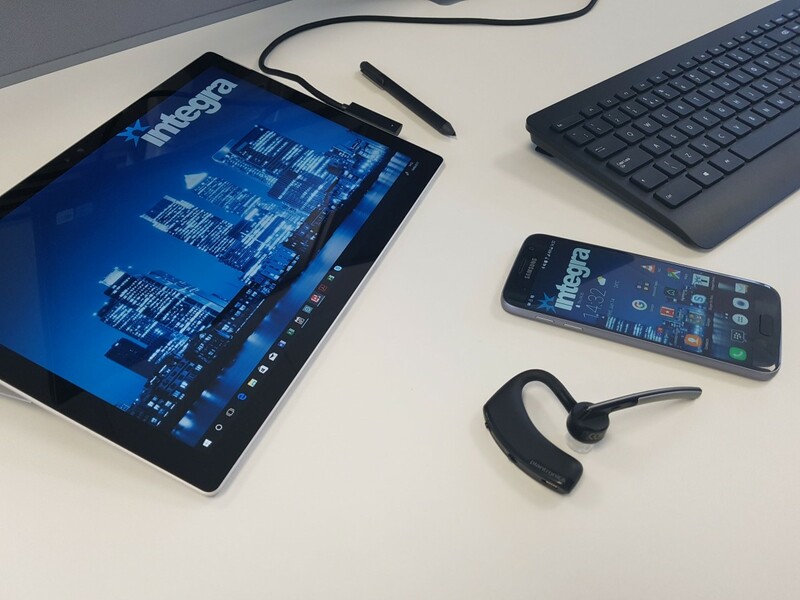 Windows ‘Hello’ protects the Surface Pro devices and keeps any unwanted people out without making Integra staff have to memorise 21-digit passwords that change every couple of weeks! 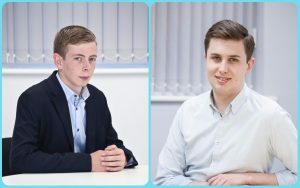 Talking about data, all our systems and communications are hosted on Microsoft Azure cloud servers and protected with the latest versions of Windows 10, Windows Defender, and Ignite so you can be certain we are reliably connected. In today’s fast-changing world, Integra is ensuring our systems won’t let you down when you need us most. Our new Medatech Priority ERP solution has been ordered and is due to be installed over the next few months. This will be a fully-integrated system which will enable us to deliver even better service to you when it is in place. Watch this space!